The easternmost portion of Arbor Heights is here in this zip, and here will be some of the more affordable homes as 98126 mostly does not extend into the view areas here. This section of Arbor Heights homes will be "on the flats," and will be a bit older in most cases and prices will be a bit lower. For more Arbor Heights homes, make sure to use the Advanced Search, or just check the page for zip code 98146. The picturesque historic homes of Belvidere and its tree lined streets makes living here feel almost like a time-warp back to more carefree days. The neighborhood is highly walkable and close to the Admiral and Alaska Junction shopping areas. Although the zip code of 98126 covers much of Belvidere, including its eastern section, where the best city views are, 98116 also applies. So in your search, also use the Advanced Search, or just check the page for zip code 98116. You will like Belvidere. The diverse home styles of Fairmount will give buyers plenty of options to choose from, and it is super close to Trader Joe's and the "coming soon" Whole Foods and all that the West Seattle Triangle offers. Fairmount is also close to the Alaska Junction, giving its residents both a quiet and convenient lifestyle. The neighborhood is serviced by Metro's RapidRide C line and there's a free shuttle to the Water Taxi. For the west part of Fairmount, also use the Advanced Search, or just check the page for zip code 98136. The newly constructed neighborhood of High Point is unique in West Seattle, as it was completely torn down several years ago. New single family homes and townhouses were then constructed along with some condos as well. It all looks like something out of a magazine, with perfectly aligned homes of complementary styles, professionally maintained landscaping and nice sidewalks. There are small home owner dues here to keep things looking nice. The residents are quite enthusiastic about their community and are eager to tell others how wonderful it is. All the homes at High Point are of generally very good quality, and affordable. The neighborhood is home to the High Point branch of the Seattle Public Library. The neighborhood of Gatewood has a very nice mix of older and brand new modern homes. And toss in all the beautiful views from many of the homes and you have a winner among neighborhoods. Mass transit is easy to get to and the streets are very walkable. There is a range of homes from the more affordable to the million dollar variety. The southwest branch of the Seattle Public Library straddles the Gatewood and Westwood neighborhoods. 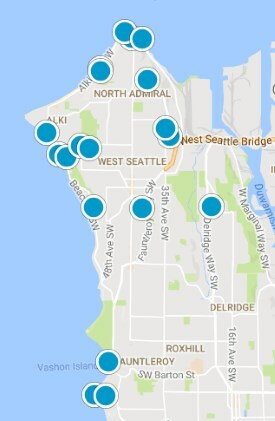 The only true shopping mall in West Seattle is Westwood Village, with Barnes & Noble; Bed, Bath and Beyond; Target; Starbucks; QFC; and many other stores. The houses in Westwood are of the more affordable variety, and the streets all have sidewalks, and most of the homes are nicely maintained. I would definitely recommend Westwood for those on a budget. Here there is convenience, safety, and great bang for the buck. I believe appreciation will be very good here too. Yes, this is the place where the Fauntleroy Ferry docks and is adjacent to lovely Lincoln Park. The 98126 portion is higher on the hill, so if you want a home that is closer to the water and the ferry, also use the Advanced Search, or just check the page for zip code 98136. The Fauntleroy area is wonderful with its quiet streets and closer proximity to Morgan Junction (the 3rd junction in West Seattle) and then travel on up north into the heart of West Seattle.